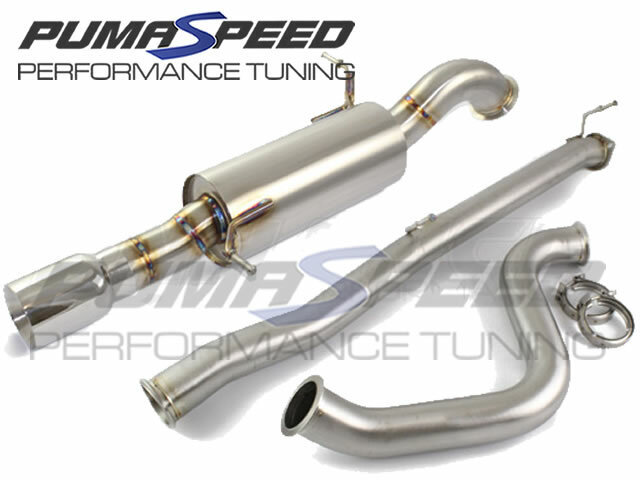 The Enhance Performance Fiesta ST180 Cat-Back exhaust system is built from 3″/76.2mm mandrel bent stainless steel. It is fully TIG welded and back purged for maximum strength, flow and reliability. Good flow is essential in a performance exhaust system, it allows the air to flow quickly from the engine and increases power. The unique brushed finish ensures your Fiesta ST180 Cat-Back exhaust system retains quality and finish. All hanger brackets are heavy duty and fully reinforced. We highly recommend fitting this system with uprated exhaust hanger bushes due to the extra weight of the stainless steel system. This is a race grade system fully compatible with the OEM catalytic converter, as well as all aftermarket De-Cat pipes. The two bolt flange is fully TIG welded from both sides and surface ground for a leak-free seal. A full lifetime warranty is included on all Enhance Performance exhausts. The Pumaspeed Workshop team are ready to fit the *SPECIAL* Enhance Performance Fiesta ST180 Catback in our Head Office located here. Therefore making parts and labour a total cost £548.00 (inc. VAT). Pumaspeed have a specialist distribution team that can dispatch the *SPECIAL* Enhance Performance Fiesta ST180 Catback to any destination worldwide.